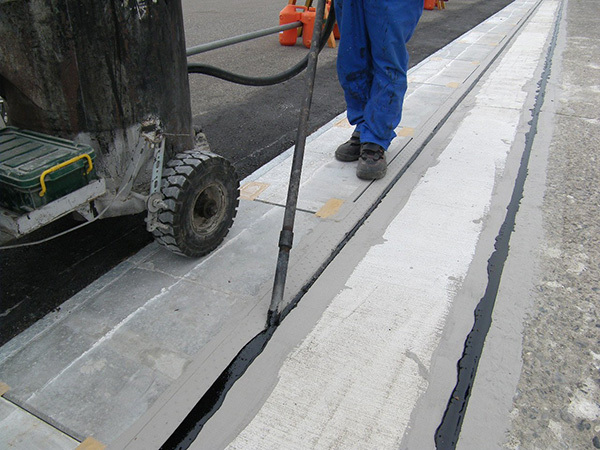 SEROSEAL SS is an asphalt-based hot applied joint sealant for concrete joints on roads that are subject to heavy traffic. Conforms to the “Hot-applied Injected Joint Material Quality (High elasticity type)” of the Pavement Design and Construction Guidelines. Even in the summer season when temperatures are high (road surface temperatures of 60℃ or more), there will be no flow or extrusion. Even in the winter season when temperatures are low (road surface temperatures of 5℃ or less), the material will not become brittle, and there will be no cracking or stripping. Because it has outstanding adhesion and elasticity, it will not allow foreign objects such as small stones to be mixed in. It never loses elasticity, so that it will adjust to expansion and contraction.